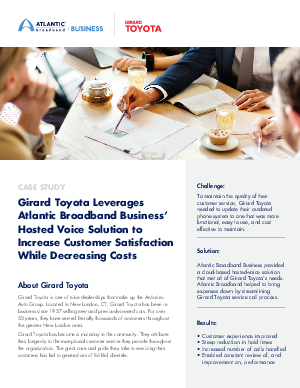 In order to maintain their commitment to customer service, Girard Toyota looked to upgrade their outdated phone system. The antiquated system they were using was not only costly to maintain, but also inhibited their efficiency — inbound calls were not answered in a timely fashion, and when they were, the hold times were much too long. Calls were not being transferred to the correct representatives, causing frustration for both new and existing customers. The entire customer experience was negatively impacted, threatening to cost the company revenue and its prized reputation for superior customer service.